No. 16 UCF returns to Spectrum Stadium on Friday night to host Lane Kiffin and FAU in one of the most highly-anticipated games on its 2018 schedule. Due to the impact of Hurricane Florence and the resulting cancellation of their game with North Carolina, the Knights (2-0, 1-0 AAC) haven’t played since Sept. 8. Having an unscheduled bye week can present some issues, but many players on the roster have dealt with the same situation in the last couple of seasons. It’s not ideal, but the team realizes that it must play the hand it has been dealt. FAU launched a Heisman Trophy campaign for Singletary back in July, similar to the “HIsman” effort UCF has for quarterback McKenzie Milton. While Singletary put up a program-record five rushing touchdowns in his last game, Milton is looking to rebound from an uncharacteristic performance in his last game. In the 38-0 win over South Carolina State, he threw three first-half interceptions and ended the night with just one touchdown pass. Despite that, the junior isn’t allowing himself to feel any pressure that could result from an off night. Milton will have the benefit of facing a shaky Owl defense that is allowing 39.3 points and 452 yards per game this season. Of course, he will continue to have help from a variety of weapons on the UCF offense. Tre Nixon, a transfer from Ole Miss, has eight catches for 154 yards and two touchdowns this season. Dredrick Snelson is still searching for his first touchdown of the year, but has 11 catches for 135 yards in the first two games. With so much focus on Milton and his talented group of receivers, opposing defenses might overlook the strong play of the Knights’ backfield. Adrian Killins, Otis Anderson, Greg McCrae and Taj McGowan teamed up for a big night two weeks ago and will be looking for more of the same on Friday night. Given the state of its offense and the struggles of the FAU defense, UCF should be able to score early and often. The responsibility is on Singletary and his offense to keep up. The fact that they have Kiffin should help the Owls, as he has a proven track record in producing successful offenses. His team averaged 40.6 points per game last year and has put up 33 and 49 points in its last two games. The question for Kiffin coming into this season revolved around the quarterback position, but he appears to already have an answer there. Chris Robison, who was dismissed by Oklahoma before his freshman year, is working on finding his stride as a young signal-caller for the Owls. After struggling against the Sooners in week one, he put up a program-record 471 passing yards and three touchdowns in FAU’s week two win over Air Force. 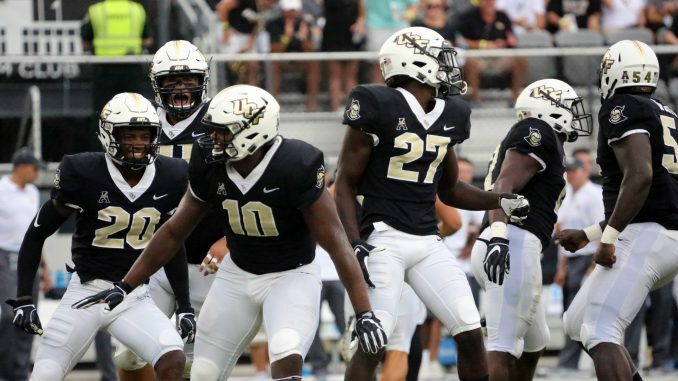 Consistency has been lacking from Robison, which is something that the UCF defense will look to take advantage of in front of what should be a rowdy home crowd. ESPN’s FPI gives the Knights, a 13 1/2 point favorite, an 84.9 percent chance to emerge victorious on Friday. But the team knows better than to overlook an opponent, especially one as well-coached and talented as FAU. Kickoff for Friday’s matchup is set for 7 p.m. The game will be televised by ESPN.